Cheval Calico House is a few metro stops from New Oxford Street. You may even have already seen or gone into some pop-up bar (we love pop up things in London) but this is certainly different. 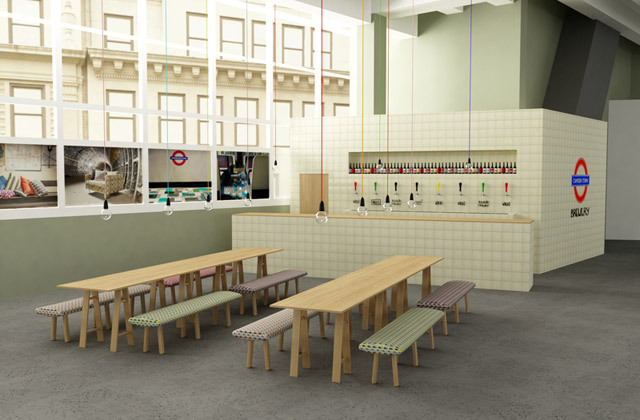 For the London Design Festival, a pop-up bar in New Oxford Street, themed as a metro station will serve London's Camden Town Brewery beer, but there will be some other foods and drinks as well, all in designjuction. Obviously, the nerd within us is excited about the prospect of drinking in a bar as a tiled subway station. Camden Town Brewery already has its own bar in Kentish Town and will soon have a microbrewery on site, so if you like the beer brand, you know you will be in good hands. But the pleasure is not just in beer. An Italian coffee directed by the ice cream vendor Gelupo, which recently named as probably the best gelateria in London, will also be on site. Enjoy a gelato with a prosecco or coffee La Marzocco in your corner on designjunction, which will be furnished by Arper and illuminated by Artemide. There will also be a bar of Chilean wines and a space for Sodastream. Admission is free, but you need to sign up for tickets. designjunction runs from 18th to 22nd September at 21-31 New Oxford Street, WC1. This event is part of the London Design Festival, which takes place from 14th to 22nd September.